So how can you tell if your dog is experiencing boredom? Most often, boredom is going to result in negative behaviors, whether it be chewing, destroying, clawing, whining, or barking. There’s not just one particular type of dog that gets restless, either. While younger dogs and working breeds may need the most stimulation, any breed or dog can become bored. If your dog is bored, You can come home to multiple holes dug in your yard, destruction in the home…you may also come home to a very stimulated dog just when your day is winding down. This can be a challenge, but we have to remember that when we come home from work at the end of our day, our dog’s day is just beginning. That’s when the awesome family interaction and affection starts.We all want to give our dogs the best possible lives, and this includes mental stimulation, entertainment, and fun. Your dog doesn’t care how tired you are—he needs to get out and about for exercise daily. Boredom and obesity often go hand in hand for dogs. Certainly boredom can lead to obesity because they’re not moving around as much, and owners often don’t recognize obesity as frequently as we’d like them to. With some dogs, just walking every day is not enough to stave off boredom or weight gain. Taking the dog to a new environment or even riding in the car to a new place can be mentally stimulating for a dog. It is recommended to go running or biking, if you and your dog are able, as this promotes added mental stimulation in addition to fitness. It releases more energy than an actual walk. Their mind has to be focused, because they’re doing the job. Walking around, they can kind of look here, look there, smell this, smell that. But running with you or biking with you, they have to pay attention. Socialization is one of the most important aspects of training, and it’s also key to keeping boredom at bay. It can help them interact a lot more with their general outside world and be more entertained. Socialization is twofold: your dog should be able to interact easily with humans as well as other dogs. If they’re socialized, they’re less likely to be isolated and bored. This process works best during puppyhood. Those first eight to 10 weeks are extremely important for them to be exposed to all different aspects of the environment—the people, the pets, and all of that—to be sure that they see things, so when they’re an adult, they’re not scared of them. Other perks of a social dog? Physical exercise and mental stimulation are that much easier to achieve. Alleviating dog boredom can be as simple as changing your feeding routine—make it a task instead of a given. Owners can use puzzles to give dry diet…hide diet under bowls and around the kitchen, or hide treats in the yard to have the dog use their nose, brain, and body to get the rewards. This doesn’t work with all dogs, as some figure it out quickly and lose interest, but a puzzle can be just the right thing, depending on your dog’s needs and level of craftiness. Many dogs—particularly herding and hunting breeds—long to be put to work. This doesn’t necessarily mean training as a K-9 police officer or pulling a dog sled; it can be any kind of task or game that involves work. 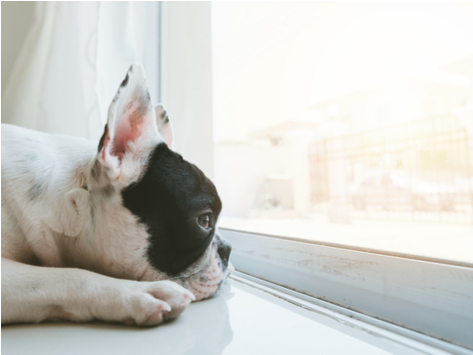 When boredom strikes, it’s often “a high-energy dog that an owner has put into a low-energy family or situation.” If these dogs are not walked regularly or given any sort of a job…they become inherently sort of excited but have nowhere to release that excess energy. Jobs can include nosework, which can just be dogs identifying certain things in the home (i.e., hiding treats and encouraging your dog to find them). Teaching new behaviors and tricks can also feel work-like to a dog, and even exercise can include an element of work. If they become a running partner or an agility partner, where they have something they’re going out and training to do, that can scratch that itch for a “job” as well. If you have the means, enrolling your dog in a class with a local trainer can be a wonderfully stimulating way to relieve boredom. If your dog enjoys nosework, for example, a class can take it to the next level. We have certain dogs that are actually in training or classes for scent identification, whether it be dogs that are cadaver trained or just trained as scent dogs with herbs or something like that. Other options for classes include obedience and agility training. Agility or jumps classes can be great to help. Jumps classes are just what they sound like—kind of like mini-equestrian courses for dogs—and agility classes combine jumps with weave poles, tunnels, and other obstacles. These courses typically require a certain level of obedience training prior to enrollment. These are not play session classes with other dogs.They focus only on the activities. In these classes, the dogs are all off-lead but have ‘jobs’ or ‘exercises’ to do in the presence of other dogs and humans. The key is not to give up: you will find the appropriate level of stimulation that will improve your dog’s life—and yours as well.